Thanks to lots of third-party innovative software, it is now very easy to view an iPhone backup. You can view the data on your device before recovering it or exporting it to computer using one of these programs. The following are five of the best programs to help you view an iTunes or iCloud backup. 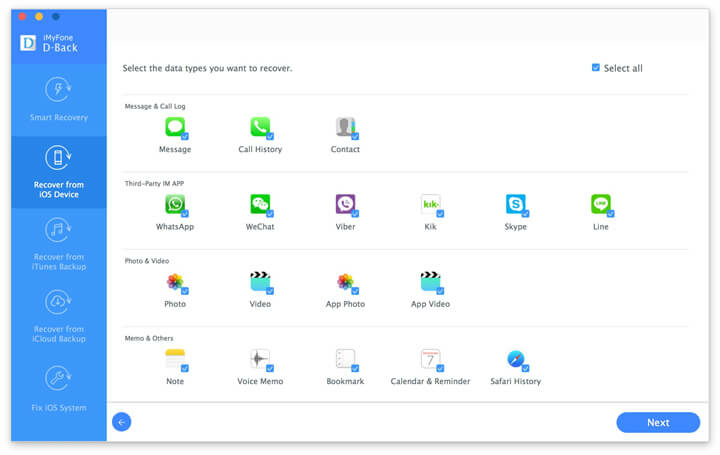 iMyFone D-Back iPhone data recovery Win version or iMyFone D-Back iPhone data recovery Mac version is a paid software that supports the reviewing of data from your iPhone backup. With the software you can review the data from the backup to make sure that all you important data is available or to select the data that you wish to save into your computer. Supports extracting data from iTunes backup, iCloud backup and from the iOS device. Supports extraction of more than 22 different files from iPad, iPod and iPhone including deleted/existing text messages, voice memos, contacts, notes, videos, photos, chats from WhatsApp/Kik/WeChat, and many more. iMyFone D-Back offers selective recovery with a preview option that allows users to select the exact file that they wish to extract. 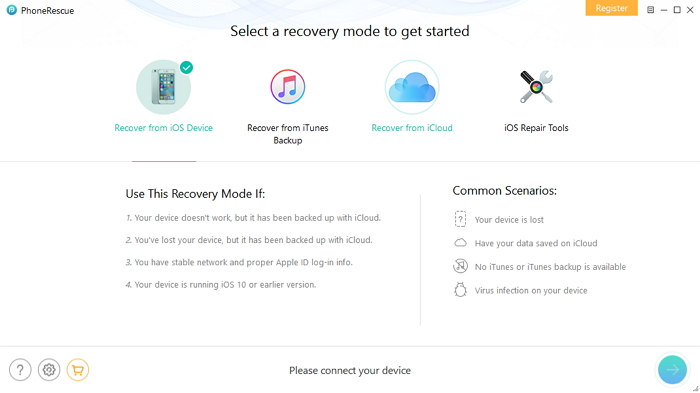 iMyFone D-Back has a system that helps fix an iOS device to normal when it faces various operational issues such as recovery mode loop, white apple loop, and black loop without causing any changes on you device. It is compatible with nearly all iOS devices and versions, including the new iPhone 7 and iOS 11. Here’s how to use it to view a backup in iTunes. The process is the same to view an iCloud backup. 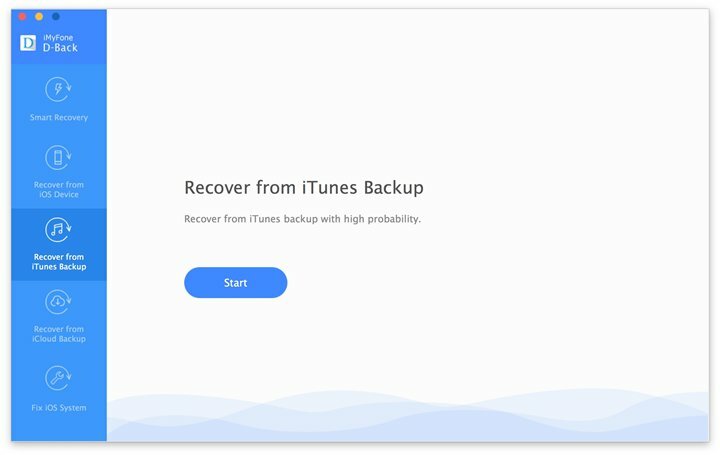 Step 1: From the main window, select “Recover from iTunes Backup” and click “Start” to continue. Step 2: In the next window, select file type and click “Next” to continue. Step 4: You can then select data you want to save to your computer and click “Recover” to save them. 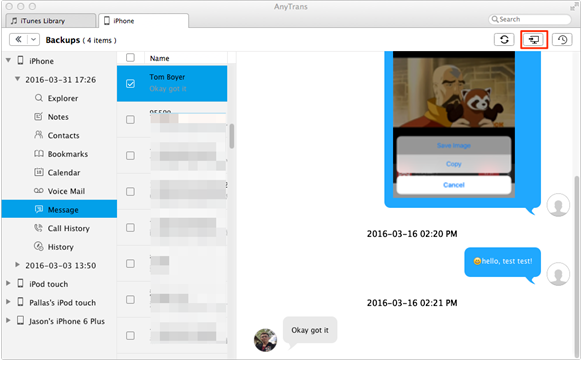 AnyTrans offers a good option to view and recover files from backup. It works perfectly as an iPhone iTunes/ iCloud backup viewer, music and photo manager and iPhone file browser. The tool is compatible with all iPhone, iPad and iPod models. Apart from viewing data from backup it can help recover and export that data to a computer. More so, it can clone files and data from one device to another. It also built with a modern design that is simple and straightforward thus making it easier to use. The shortages about the software are that it is a little expensive with a commercial price of $39.99 and it cannot view or recover deleted from iPhone or backup. PhoneRescue supports the viewing and recovery of more than 26 different file types from iCloud and iTunes backup. It supports both Windows and Mac OS and OSX. Additionally, it can view and recover data from all models of iPads, iPod and iPhone. 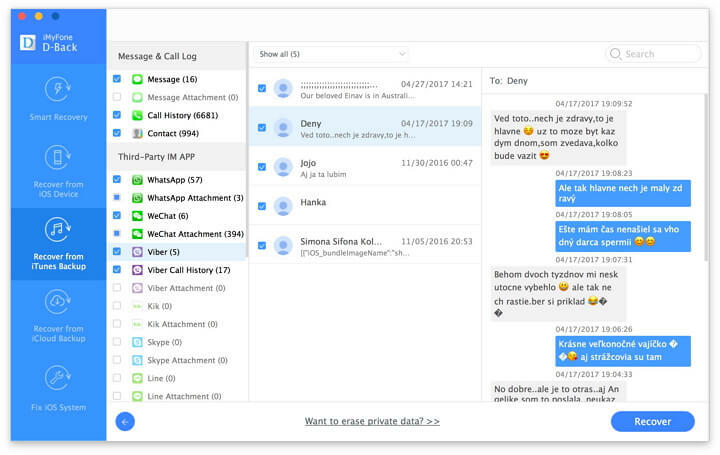 It can view backup data such as such as contacts, call history, SMS messages, safari history, camera roll, App data, voicemail, voice memo and so on. It can extract data from a backup even if the data is encrypted. More so it has a scanning option that performs a full scan of data in backup for review. The shortage is that you have to upgrade to the pro version if you want to extract anything from a backup to the computer. With iBackup viewer, one can easily scan and view data on iTunes backup on the computer. 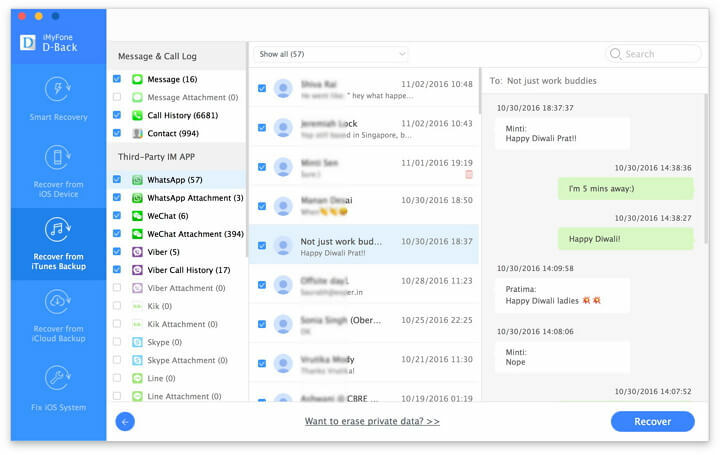 It's a free software that supports extraction of different data from iPhone backup such as contacts, call history, messages, internet, photos and App data and many more. More features include; it can locate all iPhone backups on a computer, it has simple and an easy-to use interface and it can browse and extract data from iTunes backup. The shortages include; it cannot view data from iCloud, it cannot view encrypted backup files free and sometimes it fails to scan fully iTunes backup. 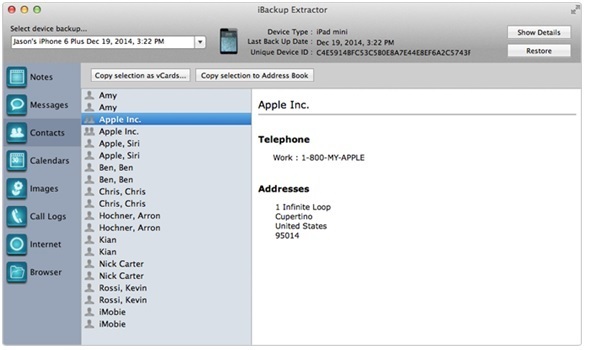 The iBackup Extractor can locate and view data backed in your iPod, iPad and iPhone backup. It can also extract the found data with ease. 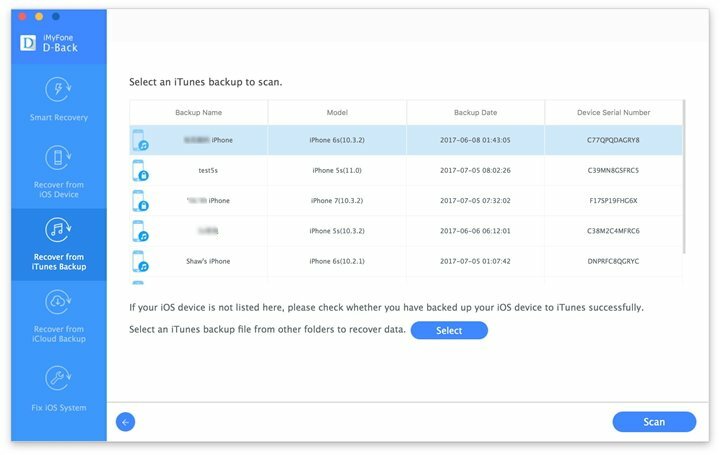 Some examples of data that can be viewed and extracted include iMessages, call logs, bookmarks, calendars, and other data from iTunes backup. The software is available both for Mac and for Windows computers and it can view deleted data. It shortcomings include the fact that it cannot read encrypted backup files for free and sometimes fails to fully scan an iTunes backup file.